When you live in a place abundant with fresh produce and near-perfect weather all year round, can you really blame the Italians for revolving their lives around food and wine? I would LOVE to live a life centered on food (and not pay the consequences!). But the reality is, I’m a conflicted health-conscious foodie. And part of that is knowing when to indulge. Italy is one such place to indulge. With only 4 days in Rome, I decided to do as the Romans do : Learn, and sample as much as I can about Italian food in half a day. 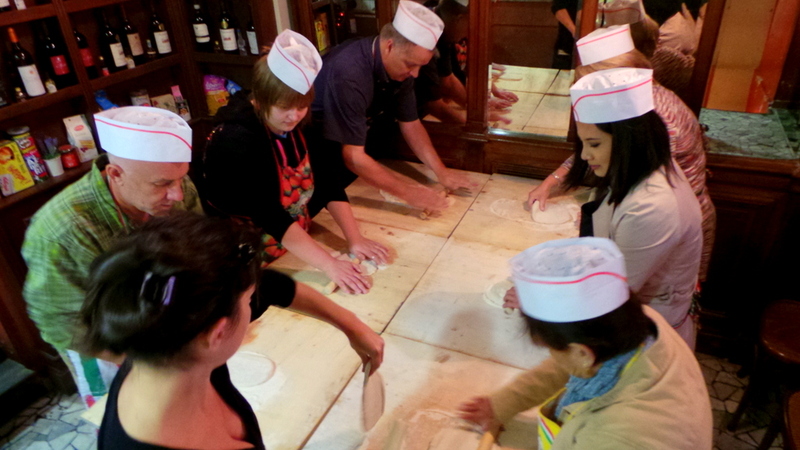 So I signed myself and my mom up for Walks of Italy’s Rome Food Tour: Pizza Making, Markets & Tastings tour. 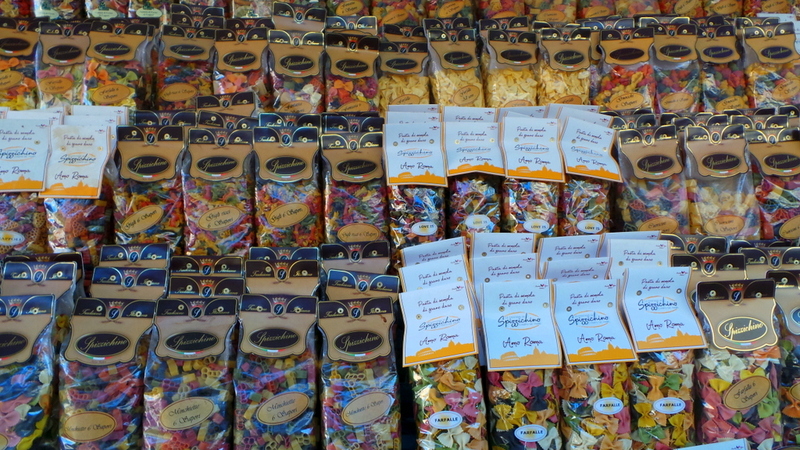 Our meeting point was at Campo de Fiori at 09:15 am. 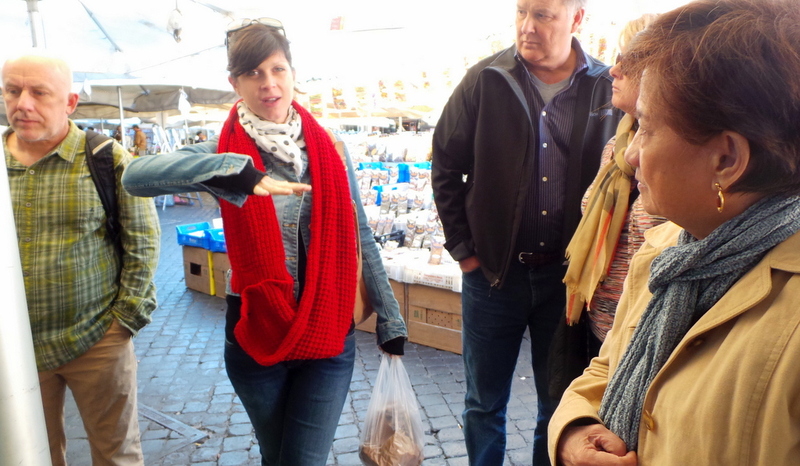 Our guide, the lovely Julia, is from the UK but has lived in Italy for quite a long time, is a self-confessed foodie and is married to an Italian chef so she is the perfect guide for this tour! 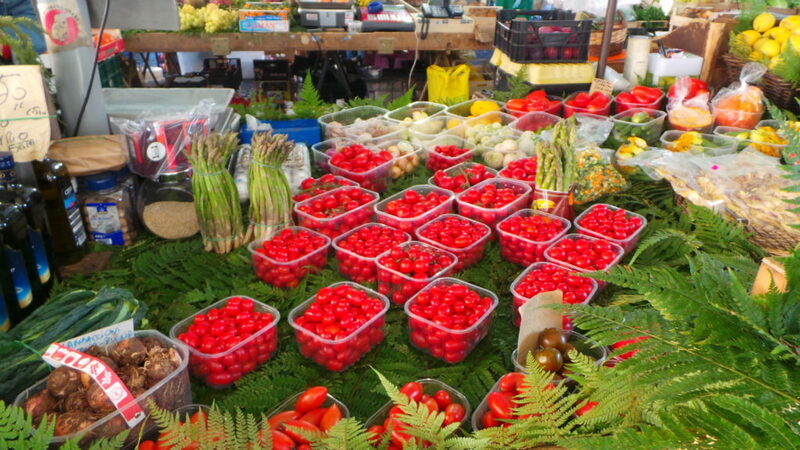 Our group is a perfect size of 6 – majority from the US, 2 solo travellers, a husband and a wife, and my mother and I.
Campo de Fiori is a bustling market selling local produce (vegetables, pasta, oils and spices among many). 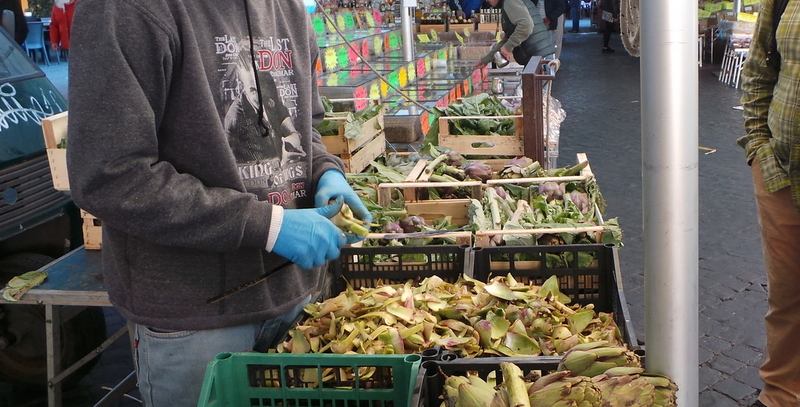 Julia explained that Campo de Fiori is a picturesque market by day and transforms into a nightlife hub by evening. 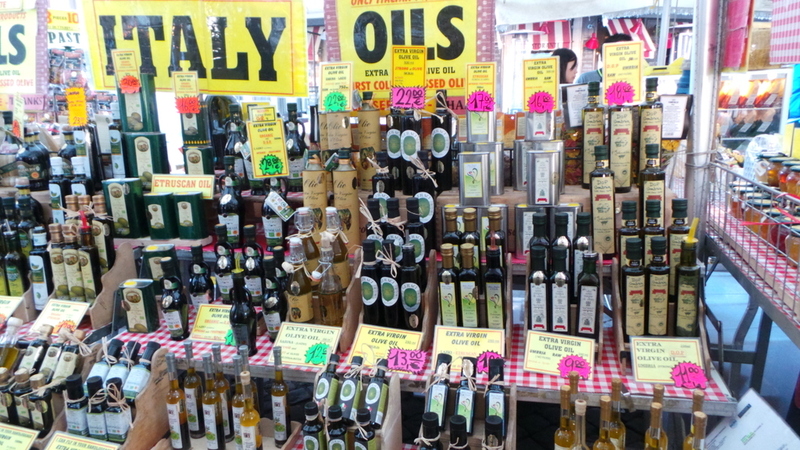 The holy grail in every Italian meal – Olive Oil. We were handed out loafs of bread to break into pieces. 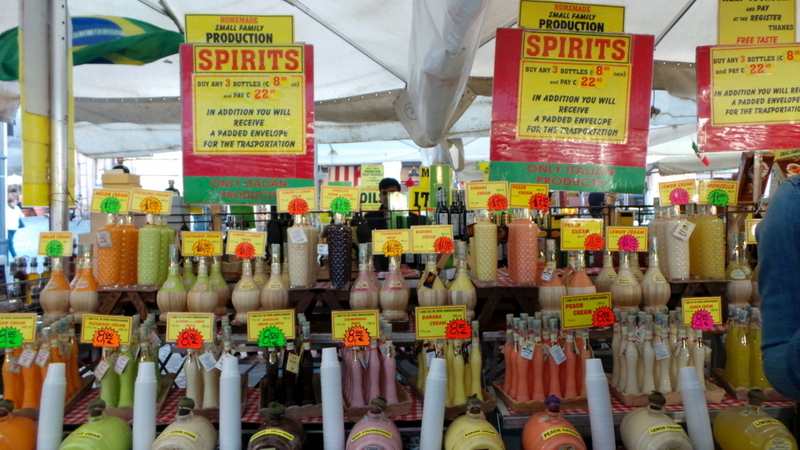 We sampled almost 10 kinds of olive oils and balsamic vinegars – all with different grades. 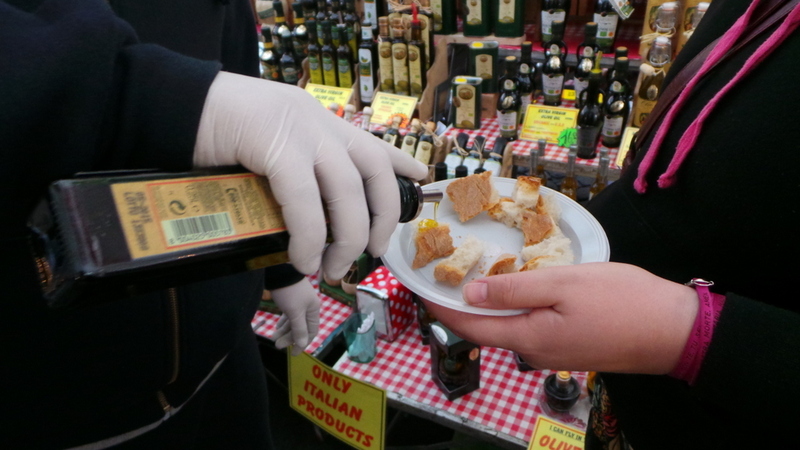 To hear Julia thoroughly explain the difference in each olive oil and balsamic vinegar variance as we sampled it: it was interactive learning at it’s best. We also tried 3 different kinds of truffle spreads – the white truffle spread was heavenly! I’m glad I didn’t have a full breakfast as I started feeling full from all these goodness with bread, oil, balsamic vinegar and truffle. 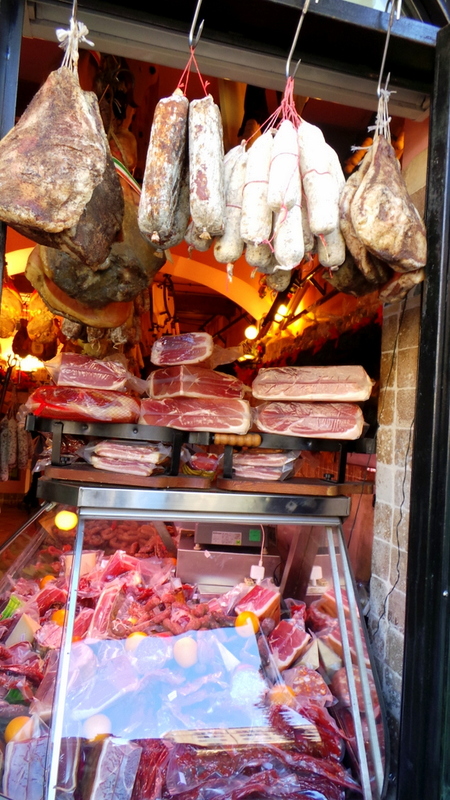 We entered a family-run meat shop and had samples of classic Italian cured meats. I’m not a fan of meat most days but I found this part of the tour to be quite enlightening. It was a sensory crash course in Italian meat aperitif for me as Julia expertly explained the different kinds of cuts and slices, how each are cured and dried differently and expertly advised how to know the difference between prosciutto crudo and cotto. The fun part was rolling the dough. I have never made pizza dough from scratch before, and my dough at one point ended up looking like a lopsided heart! With the help of the restaurant staff, we each placed our pizza dough with toppings into the wood fired oven. What’s interesting is that the pizzas took less than 10 minutes to cook, and they all came out perfectly done! Dough was crisp and toppings were fresh and so very succulent! Another more interesting thing to note – there was ZERO onion and garlic on the pizzas yet they were — humility aside-– the tastiest and freshest pizza I’ve ever had! Q: How long does the tour go for? Q: How did you get to the meeting point? Was there a hotel pick up? A: Walks of Italy is a walking based tour, so no hotel pick-ups. Everyone makes their own way to the meeting point, in this case Campo de Fiori. Walks of Italy will give you a very detailed description of the meeting place, it’s hard not to miss. Q: How was the guide? A: Our guide Julia was fantastic for this tour! As I mentioned above, she has lived in Italy for a long time (she is originally from the UK), and is married to an Italian chef so she really knows Italian food. She’s very eloquent and knowledgeable in history and Italian food. Her upbeat personality also means the tour is never boring! I know for a fact that the other folks in the tour group were also very happy with her. Her passion and enthusiasm for her job definitely shows. Q: How was the tour group? A: Tour groups can make or break the experience, and in this tour, we were lucky that the group really MADE the experience positive. We were 6 in total so it was a small, intimate group and it was just a mix of great personalities. We all jived and our ages ranged from 20’s to 60’s. By the end of the tour, we all exchanged contacts/business cards! Q: What if I don’t really like to cook or am not a foodie? A: You will still learn a lot in this tour. It’s not all about the food itself but you will get a better understanding of the Italian culture. My mother and I have entirely different interests but we bonded over this = food 🙂 And besides, isn’t this a good excuse for you to learn how to cook? Q: I’m a solo traveller, won’t I feel left out? A: 2 out of 6 in our group were solo travellers, and they definitely weren’t left out. Our guide was engaging, and over lunch, our group got to know each other. No cliques or isolation seen at all. Q: Isn’t trying or sharing food locally (with local families, etc) a much more authentic experience than a 3.5 hour tour? A: Of course nothing beats slow travel – the type of travel where you can have the luxury of time to get to know locals and share meals with them. But not everyone can afford to travel in Italy for say, a month. The husband and wife couple in our group just came from a Mediterranean cruise which stopped in Rome, and they were able to squeeze in this tour before they flew back the next day. 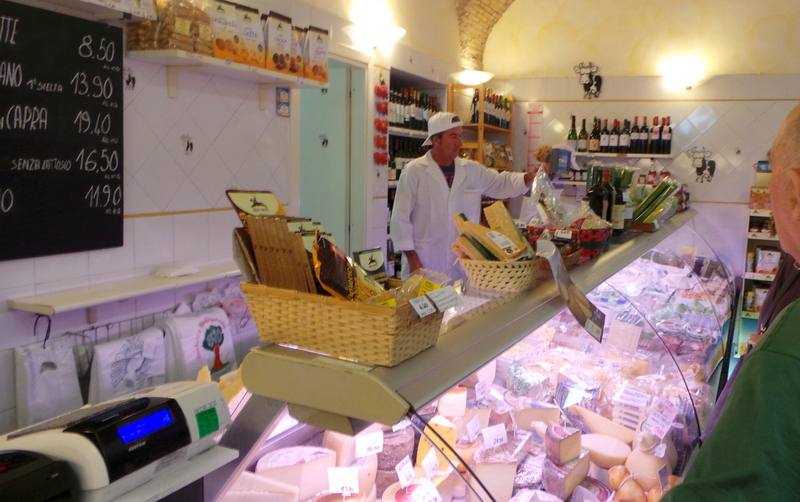 We spent time in local shops (family-owned in fact), which I believe are as authentic as you can get food-wise. Do you love Italian food? Have you ever joined a food tour before? What was it like? We were guests of Walks of Italy for this tour, however this does not affect my thoughts and opinions of this tour. All of these thoughts, along with the pizza, antipasto and cheese, are mine. All Mine. Great to hear you had fun making pizza!! We did the same first tour the first time we went to Rome! 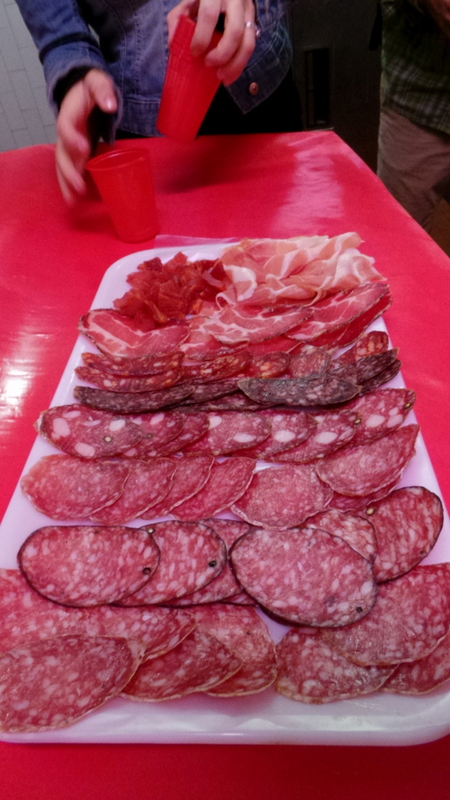 😀 All that delicious salami and cured meat! This time we wandered around by ourselves. It was great too but nice to get a basic foothold of Rome through the tour. Yum! I do love Italian food, and Italian shops too. 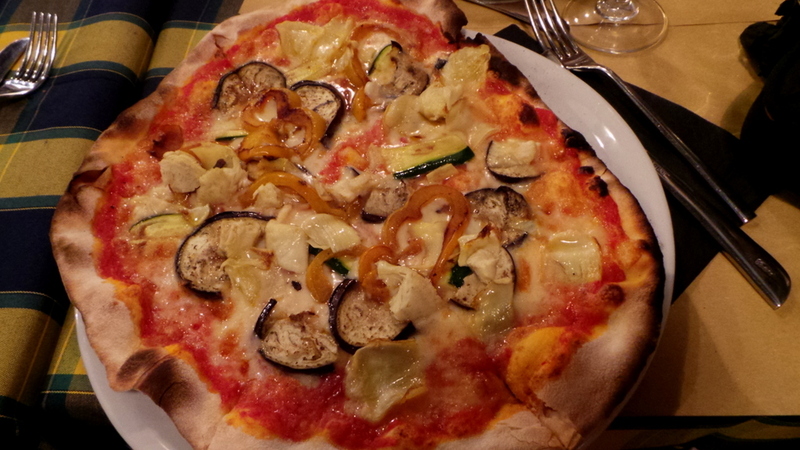 The best pizza I ever had was in Napoli, of course. Many moons ago, I lived in Genoa for a year and learned to make the local speciality, pesto, using basil from the markets – fantastic fresh food. Oh i Love pesto! that’s my next goal – to learn to make authentic pesto 🙂 And I’ve yet to try pizza in Napoli! I stumbled across this again (the video) today while revisiting our 2014 trip, in preparation of what I hope is a great 2015 holiday. What a great day in Rome. Thank you for making the video and blog available.